« What software and hardware do you use? Multifunctional grips are small, contextual menus that let you edit the properties of an object or component. Use them to quickly edit objects. 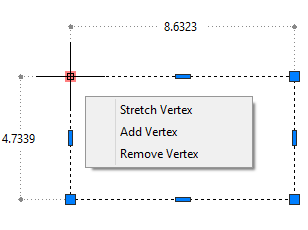 For example, when you draw a rectangle, each vertex has multifunctional grips that let you add, remove, or stretch that vertex. Similarly, an array has multifunctional grips that let you edit the number of rows in a rectangular array or the angle between items in the polar array. Choose one of the options that appears. You can also make a grip “hot” by clicking it and then right-clicking it. Along with the other shortcut menu items, you’ll find the multifunctional grip options. Multifunctional grips have been expanded since they were introduced. For example, the rectangle’s center grip menu also lets you convert the side of the rectangle to an arc. Watch the video to see how it works. Which objects have multifunctional grips? Are you using multifunctional grips? Are you using this feature or is it new to you? Leave a comment and share your experience! This is a very good tutorial, I’m really interested and thank you very much admin. I’d like to use the multifunctional grip menu, except that I am prevented from doing ANYTHING ELSE (including zooming or keyboard commands) while that menu is visible. Question … does one of the options (1-3) actually prevent that from happening? Or am I forced to go move my mouse (to make that menu disappear) before doing something? When using the multi functional feature the menu list disappears when I move my cursor, so fast there’s no time to select an option. Has anyone else had this problem?